You must have just fed your baby to heart’s content. Yet the moment you lay her on the cot, there she goes – starts crying… then wailing, so much so that you may actually see her tonsils. You have been there, right? New born babies cry, quite often if we may add. Sometimes the reasons are known and sometimes you would be totally clueless as to what has gotten on to them. You will be astonished what great set of lungs a two-day-old’s loudspeaker can have. You will be thrilled at the beginning but as the days pass your excitement would definitely turn into frustration. And you may shed few frustrated tears of your own as well. The obvious reasons – hungry, wet, tired from the new world, growth spurt, wants you to pick him/her up, hungry again… while other times getting the tears to stop is maddening task. However, as days go by, you will soon figure out a set of techniques that will pacify your baby in the perfect way. 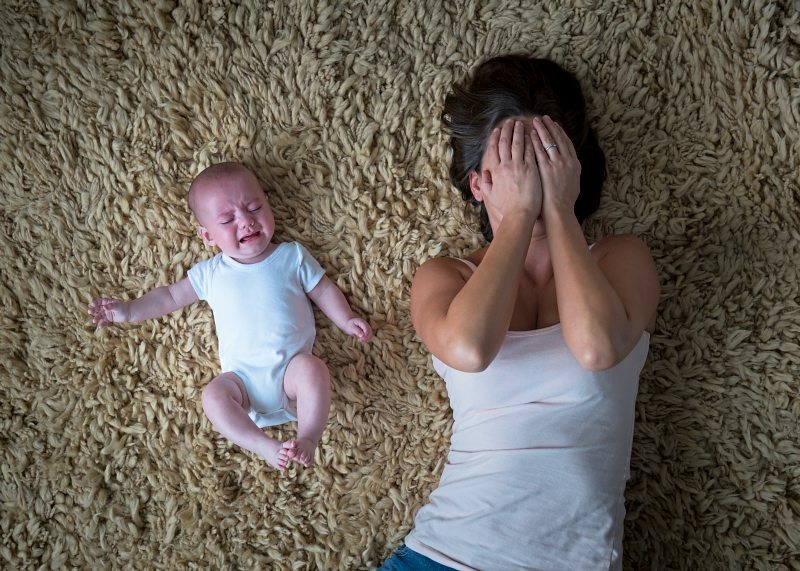 Meanwhile, we have compiled some time tested ways to calm a cranky new born. These are ideas that you can try to see which is most suitable for your baby. The baby was inside you for 9 months. This means she/he was continuously on the move, even while you slept. So, lying idle on the bed or bassinet will make him/her feel queer, unsettled or oddly unfamiliar. Rocking or swinging your baby to and fro will put her immediately in a deep slumber. This is one of the prime and successful methods to calm a crying new born. For the same reason mentioned above, a little bit of vibrating motion can instantly calm a baby down. Place your baby on an infant seat and put it on top of a washing machine. Hold the seat firmly. Taking your baby on a car or stroller ride will also help her to fall asleep. Surprisingly, we have found that the moment the papa bear picks up the cub, she/he smiles and lulls back to sleep. We still haven’t gotten to the reasoning part… because as long as the baby is sleeping and at peace, who cares? So next time, if you find your baby setting a crying record, let the man of the house hold the little one in his big wide arms. Your baby is tuned in to be packed closely in side something warm as she was inside your womb. So making her feel cosy, warm and tightly packed is the key. Your best bet would be swaddling her up with arms crossed across the chest, using thin and light blankets. You get ready made ones as well nowadays in stores. Babies are attuned to the soft and warm feel of the womb and the lingering sounds of your beating heart. Put on very soft clothing and undress your baby. Lie down on your back and place your baby against your chest. Cover both of you with a light and soft blanket. Your heart beats and warmth of your skin will put her on a relaxation mode, instantly. When your baby is inside your belly, she is constantly aware of the heartbeat, the gushing of fluids and blood and the gurgling of your stomach in the form of bass notes. 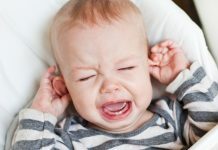 Instead of singing, hum music near your fussy baby’s ear. The ‘Shushing’ sound is also what makes babies feel at peace. Other white noises include waves, rainfall or waterfall sounds. Most babies develop colic when they are 4 – 6 weeks, which usually resolves by itself by 3 months. During this phase babies cry uncontrollably. Try the colic hold by cradling your baby facedown on your forearm. Rock her back and forth. You can keep a check on your diet too. Try eliminating dairy, onions, caffeine from your diet to fend colic in babies. Gas is a common condition in growing infants. Gently rubbing your baby’s back while he’s lying down across on your knees helps to get rid of gas. You can also bicycle her legs or give her prescribed infant gas drops. 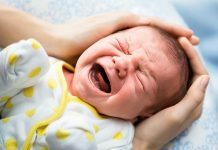 Yes, your baby may have strong sucking needs. It’s common with many new born. There is nothing wrong if you give your baby a pacifier to calm him down, according to American Academy of Pediatrics (AAP). He will most probably discontinue sucking on his own around his seventh month. 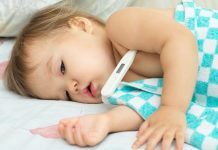 Previous articleDo Pacifiers Cause Dental Problems in Babies?